Dr. Holly Yanco founded the UMass Lowell Human-Robot Interaction Lab in 2001, and is also director of the UMass Lowell NERVE Center. Research focuses on human-robot interaction (HRI), which includes multi-touch computing, interface design, robot autonomy, trust, and evaluation methods. Application domains include assistive technology, telepresence, and urban search and rescue (USAR). The Robotics Lab also has an active K-12 community partnerships program. See the links in the menu above for more information on our lab. Research in the lab is funded by the National Science Foundation, the National Institute of Standards and Technology, the U.S. Army Research Ofﬁce, and Microsoft Research. 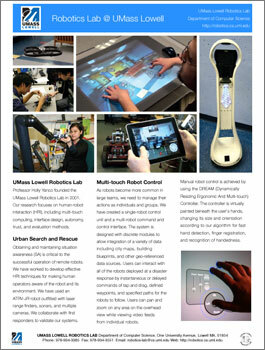 UMass Lowell offers a robotics minor. Some of the students in this minor participate in the lab's research together with the lab's MS and PhD students.